"People are strange when you're a stranger. Faces look ugly when you're alone." Green Onions & Soul Dressing - Booker T. & The Mg's CD-JEWEL CASE Free Shipping! Green Onions - Booker T. & The Mg's CD-JEWEL CASE Free Shipping! 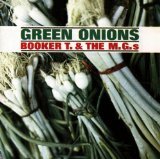 Green Onions is ranked as the best album by Booker T. & The M.G.'s. Members who like this album also like: Sgt. Pepper's Lonely Hearts Club Band by The Beatles, Revolver by The Beatles and Rubber Soul by The Beatles. Related links: top tracks by Booker T. & The M.G. 'stop tracks of the 1960s, top tracks of 1962. Showing latest 5 ratings for this album. | Show all 111 ratings for this album. The title track is of course a total classic, but there are plenty of other enjoyable tunes here. A brilliantly atmospheric record. I'm not all that into instrumental albums, but this is a really fun, light hearted record. booker T is one hell of an organ player.